This big bundle arrived at my doorstep today. I had to pay duty because inside are textiles. Canadians get punished for buying fabric from the USA. My fine was $18. Anyhow, I ordered in late December, when Girl Charlee was having a 30% off sale of all their stock. Well, I was in a buying mood and my Bitcoin was doing good so I took a plunge and bought a bale of fabric. Here is the package - I had begun to hack into the plastic barrier, when I realized I wanted to dramatize the opening by photographing. Not wanting to reveal my home address to the worldwideweb, I cleverly stuck and handmade pincushion on top of the offending label. Continued, left to right: 7) Single Spandex Knit - 1 yard 8) Cotton Spandex Blend Knit - 2 yards 9) Cotton Spandex Blend Knit - 2 yards 10) Cotton Spandex Blend Knit - 3 yards 11) Cotton Spandex Blend Knit - 3 yards. I noticed that the fabrics which are the lightest weight are the ones labeled Cotton Jersey Blend Knit, so in this case it is fabrics #2 and #3 (the wavy, shaky lines and the bird fabrics). I don't usually care for knits that are quite that lightweight, so I will see what I can make of those ones. All the others are also lightweight, but not to excess. Sooooo, what am I gonna make with these? Below, all laid out in a pretty arrangement. Oh how lovely they all are!! 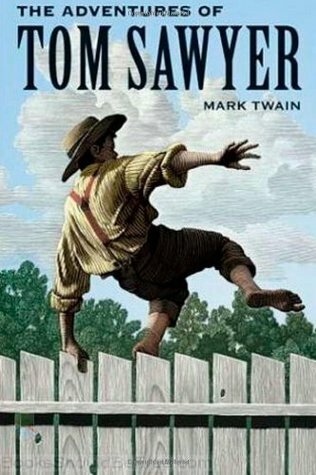 Today I finished reading Tom Sawyer to my 12-year-old son. He loved it! (I did too). It contains humor, pathos, irony, satire, mystery, romance, tragedy, horror and excellent prose! If you are ever in charge of a 12 year old boy, I suggest you read this one out loud to him. You'll enjoy it together! Below is the exact same cover of our copy.